It's that time of year...and what better way to celebrate Halloween than with a MRI of a pumpkin, rendered via Osirix imaging software? Can you see the seeds inside? I believe it was 2009 when British farrier Kevin Howes of Ridgeway Forge Farriers starred in this video about what it's like to be a farrier for Kent Television and the general promotion of British farriery. I've always meant to post it on the blog, but now regret that I saved this one for a rainy day. Kevin was killed in a car accident a few days ago in the county of Kent, England where he lived and served as farrier at the Kent County Show. It's terribly sad to learn of anyone's death. A very moving article on the website Kent Online about Kevin Howe's death mentions that he underwent skin cancer surgery for a malignant tumor while in apprenticeship, and that he completed college and his apprenticeship even though he struggled with dyslexia. Another article about Kevin and his work can be read on the This Is Kent news site. Among the racehorses credited to Kevin Howes was the 2006 Cheltenham Gold Cup winner, War of Attrition. 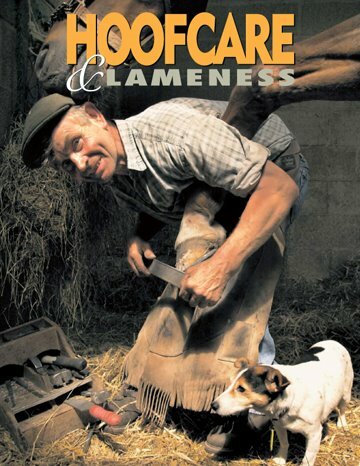 David Chapman Jones, founder of Tendonology, worked with Kevin Howes and remembers: “Kevin was a first class farrier who I trusted totally with the racehorses in my care for tendon treatment. Many top class racehorses are racing today thanks to Kevin's expertise. He was a pleasure to work with and what set him apart was his creativity, imagination and desire to solve a problem. There are so many cases we dealt with where I can say that Kevin's knowledge was as much a part of the treatment process as my input." Moral of the story: Don't be leaving too many things for a rainy day. It's about time Kevin's upbeat tribute to the job he obviously loved had its day on The Hoof Blog, but I never thought it would be with this news attached to it. Suppose you could suspend the animation of a bird or a fish or a horse...by preserving its anatomy in whatever angle or gesture or exposure you wished. 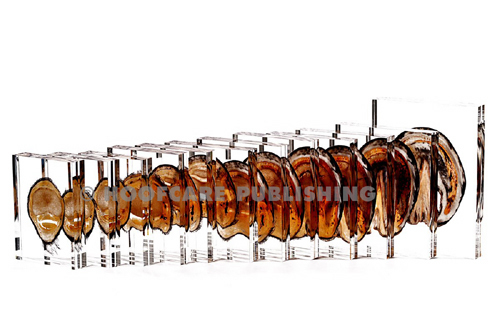 That's the power that Germany's Christoph von Horst wields in his plastination laboratory. Everything that was once alive not only lives again, but lives forever. It may no longer be living and breathing, but it's catching light and revealing its form to anyone who cares to have a look. And it has taken on an artistic, minimalist power. Dr. von Horst's company, HC Biovision, is the world's leader in preserving anatomical specimen for educational and exhibition purposes. We are fortunate that he finds the horse's foot especially fascinating. He has been encasing microscopically thin slices of hoof tissue in Lucite for several years now, and has created a portfolio of hoof pathology to rival any in a museum. Dr. von Horst will visit the USA this month; he will be helping Hoofcare Publishing introduce a new collection of plastinated hoof tissue specimen at the International Equine Conference on Laminitis and Diseases of the Foot in West Palm Beach, Florida this weekend, October 29-31. He visited previously this year to speak at the international plastination conference at the University of Toledo and the annual convention of university veterinary anatomists at Cornell University. Keep a hoof in your pocket; this new technique, called the "basic hoof" is impregnated with plastic but not cased in Lucite. Basic hooves cost only $50US (plus shipping) and will fit in your pocket. No two are alike! Each plastinate is treated to resist light damage and will not fade. The cost on most blocks is $200. Most are about an inch thick and will stand up on their own. But relief "basic" hooves start at $50--without plastic casing, just plastic impregnating the hoof tissue--and the "sheet", or thin plastic casings are $95 each. Please contact Hoofcare and Lameness if you are looking for a unique gift, award, trophy, or a real treat for your own study of the hoof. Navicular damage and chronic laminitis samples are available as real models or in laminated poster form for reference, with areas of interest like the toe of a laminitic foot or a cross-section of a navicular bone and its ligaments greatly enlarged. 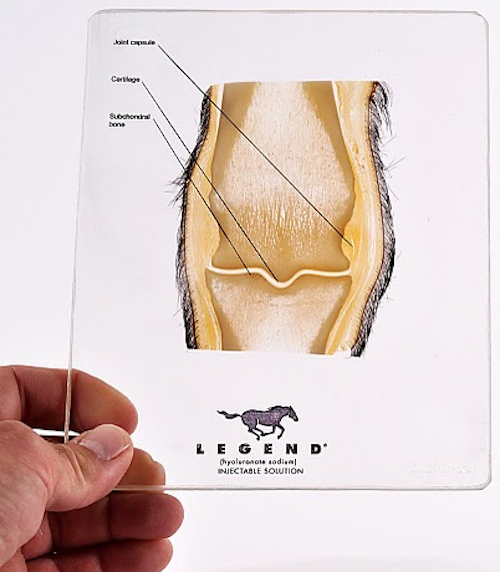 Sheet plastinates of the distal limbs of foals clearly show the growth plates and are perfect for explaining to horse owners why their horses need therapy sooner instead of later. Dr Denoix's book is the perfect companion to plastinated specimen. Highly recommended for reference for academic or professional use of specimen or diagnostic images. It is simply "THE" book to have on hand. Call 978 281 3222 or email Hoofcare + Lameness to order your copy. A superb gift! The Center for Clinical and Translational Science (CCTS) Pilot and Collaborative Translational and Clinical Science Program at The Ohio State University has awarded James Belknap, DVM, PhD, a pilot grant to be used for his research of equine laminitis. Laminitis is a crippling disease that affects horses. Similar to organ injury in humans with sepsis, it entails an inflammatory injury of the laminae, a soft tissue (of the same cell types that make up our skin) which interdigitates to support the horses’ third phalanx (coffin bone). This life threatening disease is extremely painful and can be onset by colic, enterocolitis, pleuropneumonia, and metritis. “It is a devastating disease,” Belknap said. As an equine surgeon, he commonly treats clinical cases of the disease at the OSU Veterinary Teaching Hospital. Belknap believes that the first step to fighting laminitis is to find out what signaling events in the foot prompt the disease to occur. “There is a layer of cells attached to the hoof wall called the basal epithelial cells that lose their attachment to the underlying connective attached to the third phalanx,” Belknap said. This detachment results in the third phalanx tearing loose from the hoof wall and displacing toward the ground. “It can actually perforate the sole. We need to find out what signaling is going on in these cells that causes them to lose their adherence,” Belknap said. In order to find out what the signaling events are, the team is using laser capture microdissection to collect and isolate RNA samples from laminar epithelial cells. “At this point it’s sort of a black box of what’s going on with these cells,” said Belknap. By using laser capture microdissection to collect the specific layer of cells at the point of failure, a better understanding of the role that the laminar epithelial cells play in this disease will become clear. Graduate student Britta Leise, MS, DVM, is working in the Belknap laboratory to collect the RNA samples. Once the cells have been collected by Leise, they will be sent to Texas for microarray analysis and gene networking. The cells afflicted with laminitis will be compared to those of clinically normal horses. “The analysis of these data will focus in on the cellular dysregulation that result in structural failure of the digit in the disease,” Belknap said. Once the points of dysregulation are identified, Belknap believes that it would be more likely to find an effective combination of medical treatments to combat the crippling disease. The state of Vermont is astir today with the news that one of its most beloved--and controversial--residents has succumbed to what is being called "laminitis". The latest victim of the merciless foot disease is not one of the Green Mountain State's signature Morgans. It's not an iconic draft horse on one of the dairy farms. It's not even a backyard pony. This time laminitis--or something like it--has led to a sad ending for a moose. Not just any moose, mind you, but Pete the Moose. And the citizens want to know what's been going on. First, the setting: Vermont's Northeast Kingdom. A section of the United States inhabited by far fewer people than animals, and visited by even fewer. That said, it is one of the most beautiful places on earth. You just can't quite get there from here. Or anywhere. It's a corner of Vermont wedged between Quebec and New Hampshire, but that doesn't really matter because you probably won't ever have a reason to go there. Then, some background: Pete was injured as a mooseling. He was attacked by dogs and left to die. But he was nursed back to health for over a year by David the Vermonter. They became attached, best buddies, an odd couple in the interspecies world order of things. Things got messy when the state government ruled that David didn't "own" Pete. They decided that if Pete couldn't live on his own in the wild, it would be all right if Pete went to live in a hunting preserve with some imported elk. Then the state had second thoughts. Things got even messier. Just suppose one of those elk had a disease like BSE, or "chronic wasting disease" (think: a wildlife version of mad cow disease) and Pete contracted it. Then suppose somehow Pete escaped and went back into the wild and spread the disease around Vermont. Enter: lawyers, courts, the governor. Was this a wildlife issue or an agriculture crisis? Pete received the death sentence. But wait! Then the governor (also named Pete) stepped in and pardoned him, forcing a stay of execution. Pete became quite a celebrity. He had over 6000 "friends" on Facebook. If you can have a big cat or a poisonous snake for a pet, why can't David have a moose? A video of David, Pete's friend, when the state government was threatening to "remove" Pete. He was living in a 600-acre private game sanctuary for elk at the time but the state thought he was a public health risk. Things went quiet for a while. We didn't hear anything about Pete. Then he turned up dead. Or didn't turn up, as the case may be. The news this morning from Vermont is that Pete died on Labor Day when "tranquilized" (no further information given) in order to have his hooves trimmed. Vermont Fish &Wildlife Department Commissioner Patrick Berry said in a press statement: "Most of the people who have been fans of Pete the Moose have never fully understood the story," he said. "It's not a good idea to trap wildlife behind a fence and feed them beer and doughnuts. This is a good example of what happens when you don't keep wildlife wild." "The hoof condition he was being treated for likely was caused by eating corn and other foods not part of a moose’s normal diet during his years in captivity," Berry is quoted as saying in the Burlington Free Press. According to ABC News, Pete enjoyed munching on apples, bananas and Snickers candy bars but refused to eat Milky Ways. Meanwhile, Pete's body disappeared. According to state law, the carcass needs to be tested for chronic wasting disease. So in the Northeast Kingdom of Vermont, there may still a moose on the loose but someone is going to need to produce a carcass. Laminitis in moose around the country may actually be on the rise. North Dakota is one state that is concerned about the problem, as moose migrate into farmland and feed on grain. A study by Butler et al followed a series of necropsies on four moose believed to have died from grain overload. In particular, "Case A" from that study was described: "... was in good body condition and was presented at necropsy with moderate postmortem change. It was noted that all 4 digits had severely overgrown claws. The hind and front claws were approximately 30 cm and 20 cm longer than normal, respectively. Separation of the dorsal claw from the third phalanx was evident. Severe congestion was noted around the distal aspects of the third phalanx in both front digits.... A diagnosis of severe, chronic laminitis in all 4 feet was made." That paper was published in Alces, the journal of moose. A paper published by the University of Zurich chronicled a zoo moose diagnosed with laminitis. Postmortal radiographic diagnosis of laminitis in a captive European moose (Alces alces) by Clauss et al is available as a free pdf download. Research going back to 1977 in Alaska begs the definition of what laminitis is. 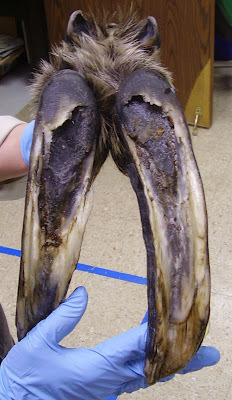 Indications of Copper Deficiency in a Subpopulation of Alaskan Moose by Flynn et al described a copper and sulfur deficiency that caused abnormal keratinization of moose hooves. "Faulty keratinization was linked with copper deficiency by both mineral element analyses and photoelectron spectroscopy. Decreased copper and sulfur hoof content and an abnormal electron spectroscopy chemical analysis (ESCA) spectra indicated incomplete sulfur cross-linking in the hoof keratin." According to the European Bioinformatics Institute, keratinization is defined as "the process in which the cytoplasm of the outermost cells of the vertebrate epidermis is replaced by keratin. Keratinization occurs in the stratum corneum, feathers, hair, claws, nails, hooves, and horns." That paper was published in the Journal of Nutrition and can be downloaded for free by clicking on the link. Hoof deformities of elk have also been studied; a poster presentation showing anatomical specimen can be viewed as a free-download pdf file: Severe Hoof Deformities in Free-Ranging Elk in Western Washington State by Han et al. Who knows what killed Pete the Moose? Someone somewhere does, and maybe the truth will out. The latest news reports are stressing that an error or adverse reaction in the use of the tranquilzer probably actually killed Pete, but still more information is needed about what was wrong with his hooves. There is no doubt, however, that some sort of hoof condition is becoming common in moose across North America. Shall we blame it on global warming? Acid rain? Encroaching civilization? One thing is for sure: it's not the moose's fault, and the relatively recent onset of the problem suggests that maybe something can be done to help these most fascinating animals stay on their feet. Something's not right but in studying abnormal moose hooves perhaps we'll learn something about horses, too. Moosewatch blog from Utah: A kind human has been feeding a wild moose horse feed and hay. Includes photos of the moose's deformed claws. Interesting to see that the deformity is visible on both lateral claws of the front feet. Presentation "Moose Management in North Dakota" by William Jensen, North Dakota Department of Fish and Game at the Minnesota Moose Summit, 2008. The 2011 Pan Am Games opened tonight in Guadalajara, Mexico with a gala opening ceremony. First though, the dressage horses had to pass the veterinary inspection at 9 a.m. this morning: so far, so good as far as we know. It sounds like Team USA has so far kept out of the way of the Mexican hurricane Jova, but the weather was bad enough that ESPN reported the opening ceremonies might be canceled. And then the sun came out! The dressage horses have settled down in Guadalajara, in part thanks to the team of seasoned professionals in charge of their stabling, their health and their hooves. 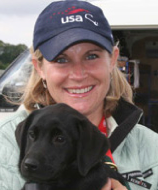 The United States Equestrian Federation's Joanie Morris provided some "barn notes" for Hoof Blog readers about the team behind the team. Barn Manager Doug Hannum first traveled with the United States Equestrian Team in 1966 as a show jumping groom--and he hasn't missed much over the last four decades. The first Team horse he looked after was called Ilan; he belonged to James Paxton but Frank Chapot rode him on the US Team and Dougie was part of the deal. He was around when a jumping horse named Sloopy had to take a boat to Germany from the United States because he was so frightened on the plane that they wouldn't let him fly. That was in 1972. If it's broken, Dougie can fix it. If a horse needs some physio work, he's your guy. 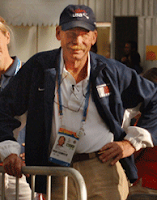 Veterinarian Rick Mitchell started his tenure with the U.S. Equestrian Team with the show jumpers -- he was an accredited vet at the 1992 Olympics but his first official team trip in 1995 was to the Pan American Games. This is his fourth Pan Am Games. He has done three Olympic Games since 1996. His first with the dressage team was in 2008. His wife Julie works alongside him as a tech and administrator. They are a fantastic team. 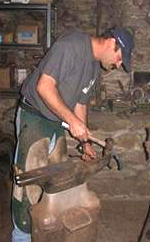 Farrier Stephen Teichman did his first U.S. Equestrian Team work in 1997 at the Open European Championships for Eventing and then the World Championships in Rome in 1998. He has pulled off some miracles in his days, including putting an open shoe on backwards to serve as a bar shoe in a pinch at a horse inspection. It was the first and last time he traveled to another country without bar shoes. 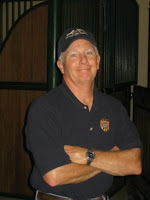 When it comes time for eventing to begin, Brendan Furlong will be taking over for the United States. The horses is his care will be competing against the Canadians, among others. Under the heading of "small world", the eventing veterinarian for Team Canada is none other than Furlong's Florida-based associate, Christiana Ober of Peak Performance Equine Services in Ocala/Williston. The stable, health and hoof crew for Team Canada is stable manager Debbie Furnas, team farrier Randy Pawlak and team manager Fleur Tipton. The Hoof Blog will share any relevant news that drifts northward from Guadalajara. The Hunterdon County Democrat in New Jersey published a great article today about B.W. Furlong and Associates and the practice's role in the Pan Am Games. Photo sources for this article: Doug Hannum via equilite.com; Rick Mitchell via Al Guden and Hyperion Farm of Wellington, Florida; Stephen Teichman via Chester County Farrier Associates; Brendan Furlong via B.W. Furlong and Associates; Christiana Ober via Peak Performance Equine Services; Randy Pawlak via Hoofcare and Lameness archives and Forging Ahead. Professor Doctor Bodo-Wolfhard Hertsch, 68, a noted international researcher and educator on laminitis and navicular disease in horses, has died at Eichenhof Tremsdorf, the equestrian center he ran with his wife outside Berlin in Germany. The cause of death being reported by German web sites is that he died of injuries after he fell from a horse. "His death for us as humans, horses, expert riders and organizers rips a deep hole," said Peter Fröhlich, director of Landesverband Pferdesport Berlin-Brandenburg e. V. (LPBB). As early as 1993, Dr. Hertsch was studying the microcirculation of the foot at different stages of laminitis and creating angiograms that would eventually yield to the venograms used today. His study "Microangiographic investigations in acute and chronic laminitis in the horse" examined the distal limbs of 27 horses of different breeds as well as of one donkey who were suffering from acute or chronic laminitis. Most of us in America first met Bodo Hertsch when he spoke at the 1991 Bluegrass Laminitis Symposium, hosted by Dr. Ric Redden in Louisville, Kentucky. "Navicular Bone Microcirculation, Coffin Joint Effusion and Navicular Pathology: The Diagnosis and Therapy of Chronic Disorders of the Distal Sesamoid Bone in Sport Horses" was the title of his first lecture. We certainly learned the word "podotrochlea" that day. Even more prophetic, Bodo Hertsch's second lecture: "The Principle of Heel Elevation as a Possible Treatment for Acute and Chronic Laminitis in Horses". He explained to us that laminitis therapy in Germany was based on the Bolz shoe, adopted in 1939. Hertsch reviewed laminitis cases at the vet school and the rate of success of the shoe, which called for lowering the heels. He proposed instead that the heels be raised. His paper is worth reading; it was the early days of raising heels but his explanation of the Bolz shoe and the historic study of laminitis in Germany up until the outbreak of World War II is fantastic. Dr. Hertsch has a paper on laminitis research in the current edition of Tierärztliche Praxis, the German veterinary journal that challenges the observation that laminitic horses have accelerated heel growth, or retarded toe growth; according to Dr. Hertsch, growth is uniform, but the disease causes the tubules to growth in a different direction, kink, and fold rather than growing downward. "Growth of the hoof horn in horses with chronic laminitis" examines the correlation between rotation and/or sinking of the third phalanx (P3) and changes of horn growth on the hoof wall. Dr. Hertsch painstakingly reviewed radiographs or performed radiographs on 117 slaughtered or euthanized horses with chronic laminitis. He documented that in the chronic stage the vascularization changed according to the degree of rotation, the duration of the disease and its development. To quote from an English version of the abstract of the paper: "A rotation angle of approximately 8° was found to predict a change in the direction of the growth of the hoof horn at the dorsal and the lateral hoof wall. In addition, a correlation between the rotation angle of P3 and the length of growth of the hoof could be highlighted. A greater angle could lead to a larger interruption of the dorsal horn growth; meanwhile the palmar/plantar horn growth appeared to be independent. A correlation between a medial/lateral rotation of the pedal bone and the length of the horn was not observed." 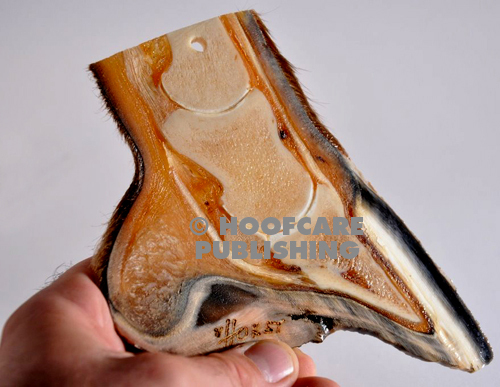 Dr. Hertsch's conclusion: "The direction change of the horn tubes might cause a decrease of the visible length growth of a chronic laminitic hoof. Therefore, it appears to be important to differentiate between the externally visible length of the hoof and the real growth of the horn. Apparently, the amount of horn produced is the same on the dorsal hoof wall and in the heel. 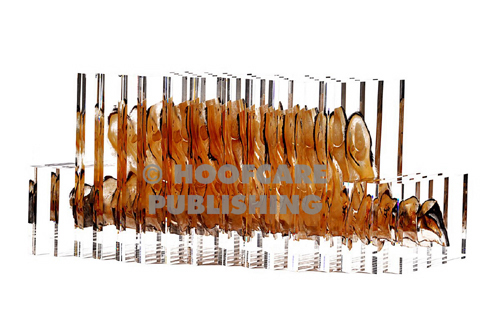 In horses with moderate laminitis the horn tubes on the dorsal wall were lying in folds, with the consequence of a decreased visible length growth. Only the formation of wrinkles of the horn tubes on the dorsal hoof wall reduced the visible wall length. Formation of wrinkles of the horn tubes in the heel could not be observed. "Interestingly, the results of this study show that the lateral rotation of P3 does not promote the formation of wrinkles of the horn tubes along the lateral or medial hoof wall. According to our results, a resection of the dorsal hoof wall might be a sensible therapeutic approach in horses with chronic laminitis showing a rotation of P3 of at least 8°." For many years, Dr. Hertsch was with the veterinary school at the University of Hanover, but had in recent years been Director of the Department of Veterinary Medicine at the Clinic for Horses at the Free University of Berlin. After his retirement, Dr. Hertsch had a private clinic at the equestrian center, Eichenhof Tremsdorf GbR, which he ran with his wife, Ingrid. Dr Hertsch was the organizer of many meetings in Germany and had most recently, in 2008, organized and chaired the International Symposium on Laminitis in Berlin. In 1995, he hosted the international symposium on navicular disease. 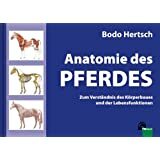 He also authored many books including The Horse's Hoof and How to Shoe It Without Nails, with Hellmuth Dallmer, and Anatomy des Pferdes, as well as many others. "Horses are his passion: he rides them, he breeds them, he heals them," was a quote from a recent article about Dr. Hertsch. Recently, Dr. Hertsch had been in Great Britain at Hickstead to represent Germany in a special FEI senior Nations Cup international team competition in show jumping among 38 riders who are also veterinarians. Bodo Hertsch was the champion, and he did it on Lucinda, a 15-year-old mare that he bred and raised himself. In addition, he led the four-member German "A" Team to win. That was just his style. I'll miss Professor Doctor Hertsch. His research contributions are important but his vision for the future and his obvious love for and involvement with horses set him apart and above so many others. Did any of his horses ever have laminitis? I don't know what drove him to delve so deeply into the disease, but I'm glad he did. He could have chosen any specialty but like so many of the people I know and respect, he chose the most difficult and challenging problem in the horse world and looked it in the eye. Assistance with this article was provided in Germany by Susanna Forrest, author of the forthcoming book If Wishes Were Horses (and the blog by the same name), in Berlin, and by anatomist Christoph von Horst PhD DVM of HC Biovision in Munich. Photo of Professor Doctor Hertsch via Eichenhof Tremsdorf. The Sixth International Equine Conference on Laminitis and Diseases of the Foot gets underway in just under three weeks. The conference returns to West Palm Beach, Florida with a triple-focus program in scientific, clinical and horse management advancements in the study, causes and treatment of laminitis and foot diseases. Today the conference announced an expansion of its popular poster session. Formerly limited to students and scholarship recipients, an open poster session at the 2011 conference will be a pilot program to allow conference attendees to present their own research and accomplishments and to stimulate dialogue among professionals at the conference. Full details will be available on the laminitisconference.com web site in the next few days, but Hoof Blog readers who will be conference attendees can begin planning by marking their calendars: an abstract or summary must be submitted by Friday, October 21. At least one author listed on the poster must be present to hang, take down and defend the poster during a judging session on Saturday afternoon. Resources for vet clinics and farriers and allied colleagues who are not accustomed to preparing posters will be available on the web site, including the consultation services of a poster expert. Examples of some of the topics that might be explored in a poster presentation include case studies, cumulative case reviews, new product trials, stable management protocols for equine rehabilitation, and "how to" instructions. Do you remember where you were on October 4, 1989? Maybe you hadn't even been born. Or maybe you still remember that feeling of loss, of stunned disbelief, that the horse to end all horses was no longer in a paddock somewhere in Kentucky. We know so much more about laminitis now than we did then, but could Secretariat have been saved? We'll never know and it's futile to speculate. Today we often hear about horses being euthanized during or after laminitis. The deaths are routinely reported in the narrow columns of The Blood-Horse, or the breed or sport organization publications. No one issues a press release for a backyard pony. No one tallies up the toll of insulin-resistant Morgan horses at the end of the year. 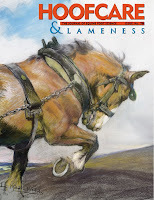 Death by laminitis makes us uneasy, we move on quickly, with lumps in throats as we wonder if our own horses could fall victim to the same fate. If Secretariat couldn't beat it, what horse could? The pain is no less great for a little black pony or a portly pet horse than it was for Secretariat. In that sense, Secretariat was just like every other horse: he couldn't beat a disease with more zigs and zags than he had. While researching today's article, I found some new footage I hadn't seen before, a montage of television news reports and a home video of Secretariat taken three days before he died. I suppose Secretariat is a bit like Elvis or Michael Jackson. He is larger than life, even after death-- just as he was when he lived. His death cast a long shadow on every horse who has had severe laminitis since: "This is the disease that killed Secretariat, don't feel badly if we have to euthanize your horse." How many times have veterinarians used some variation on those words to prepare horse owners for potentially bad news? But here's one the newscasters didn't see that night. Here's Secretariat on one of his last days. And a home video, no less. Three days before he became a statistic, just like the others. On this day, he was still the greatest racehorse in recent American history, still our horse, and still invincible. People still came to see him, and stood in awe, even if he was about to lose the biggest challenge of his life. We all like to remember Secretariat winning the 1973 Belmont Stakes by 31 lengths, but let's not forget the disease that took him. If you possibly can, please donate to laminitis research today in memory of Secretariat, or make plans to attend the Sixth International Equine Conference on Lamintiis and Diseases of the Foot, to be held October 29-31 in West Palm Beach, Florida to learn more about what can and will be done to stop this disease. Consider clicking on the donation button at the Animal Health Foundation's laminitis research page. Do it for the horse we loved to love, and for every horse before or since that has known the pain of this terrible disease. Do it for the horses of the future who might be able to bypass laminitis altogether, with your help.